Dennis Yates Wheatley (8 January 1897 – 10 November 1977) was an English author whose prolific output of thrillers and occult novels made him one of the world's best-selling writers from the 1930s through the 1960s. 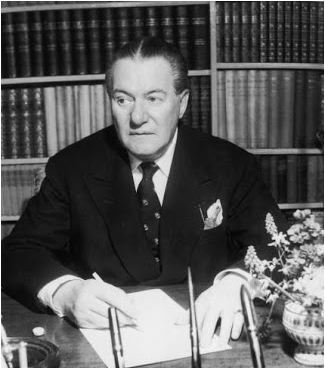 His Gregory Sallust series was one of the main inspirations for Ian Fleming's James Bond stories. If you have ever read any of his books you will decide he had some inside information with his reference as to evil men, New World Order and the devil. In 1947, he referenced what he foresaw as the future - During the winter of 1947, Wheatley penned 'A Letter to Posterity' which he buried in an urn at his country home. The letter was intended to be discovered some time in the future (it was found in 1969 when that home was demolished for redevelopment of the property). In it, he predicted that the socialist reforms introduced by the post-war government would result inevitably in the abolition of the monarchy, the "pampering" of a "lazy" working class, and national bankruptcy. He advised both passive and active resistance to the resulting tyranny, including "ambushing and killing of unjust tyrannous officials."